I'm feeling a compulsion to share, so I will. Earlier this year, I gave an effort at describing a development-6 culture. I did all right with the development-5, but even one step higher got confusing and hard to express. That has been my problem all along ... and it is due, in large part, to my wanting to be comprehensive in describing the elements of the development. The information has to elaborate on possible scenarios that could lead to an adventure. Whereas some feel that description is confining, I feel just the opposite. It would be impossible to fully define all the elements, down to the last person, in so many hexes as exist in my world ... so any descriptions are bound to suggest a multiplicity of ideas. The detail has to reduce the ever-present difficulty of the "empty hex." If people live there, it can't be empty ... it must have some kind of character and feel. That's what we're trying to give in any system that generates a given result. To some degree, many hexes will have the same characteristics, since these are generated results. Hopefully, however, the details being generated are surface details ... leaving plenty of room for the specific culture, religion, climate, terrain, vegetation, proximity to other places and so on to create enough unique elements that the surface characteristics can be expanded as necessary. Finally, that areas of one development are distinctly different from another. For this post, I'm going to compare four different hexes: two within a 5-development space, and two within a 6-development space. Before I get to that, however, I will need to catch the reader up on some points. A given hex of this "group" would either be "inhabited" or "wilderness." If all seven hexes were wilderness, we'd call this a type-8 hex. If one were inhabited, it would be a type-7 hex. 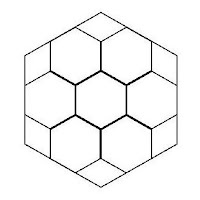 Two inhabited would mean type-6, and right down until all the hexes being inhabited would make the hex a type-1. Now, I've played in all sorts of ways with this since proposing the idea in 2011, some I've discarded and others I've built upon. For the purpose of this post, just assume all four of the hexes I'm going to highlight are type-5 hexes. This means, each hex will be about 37% inhabited and 63% wilderness. Dev-5 is a region based on gathering, with a focus on hunting, fishing and mysticism. Dev-6 retains characteristics of Dev-5, modified however by the inclusion of agriculture, animal husbandry, archery, mining and the wheel. That's all I have to go on. Because some hexes have a designated settlement in the hex, while others don't, I'm making a distinction between these two forms. A type-5 hex that has a settlement is called a "settlement-5" hex; a like hex without a settlement is called a "rural-5" hex. A Dev-5, rural-5 hex. That is, a hex that is 37% inhabited, without settlement, in a development-5 region. The idea is to show how four very similar hexes, all with the same amount of cleared wilderness, from two closely similar development phases (after all, I'm not comparing Dev-5 with D-13), can be given distinct, interesting characteristics. That's the goal, anyway. I'm going to present these as excel blocks, because this is how I am keeping track of the information. And believe me, there is a lot of information. 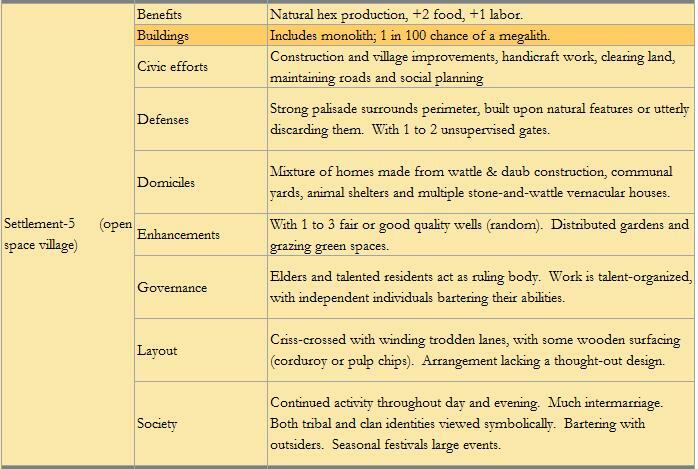 Just so you know, these blocks all come from a much larger table, as there is a similar block for every kind of hex type, for both rural 1 to 8, and settlement 1-8, as well as details about improvements, buildings, culture, wealth, labor and so on. There's quite a lot ... but we don't have to go into all that right now. Anyway, that's why the edges of these blocks are uneven. This is an unusual hex in a hunter/gatherer society ... most rural places in regions with this level of population density would never result in a randomly produced rural-5 hex, but just in case I've conceived this. It is "sylvan" in the sense that the natural vegetation, water sources and available forage and animal life is so ideal that it could support a population of a few hundred indefinitely, without their having to move. Well, much. In unseasonable times, the hunters would probably move south, or perhaps to a lower elevation. Predation describes the monsters encountered. I've based this on my recent monster-type encounter design post. The "improvement" indicates that if there is a trade reference here for a product such as fish, a "fishing ground" results, adding +1 food to the natural food supply. If there's meat, skins or animal products, then it creates a "hunting camp," which again creates +1 food. The land itself would probably naturally produce (binary-11) food. Rural-5 means that it produces (binary-111) food. And if there was a fishing ground, it would produce (binary-1111) food. A hunting ground as well would produce (binary-11111) food. In base-10 numbers, that's enough food to just feed 2,170 people the bare necessary calories to ensure not starving. A few hundred people in such a hex would be quite fat people. This is marginally a greater chance for occurring that it's rural counterpart, but still represents the pinnacle of the this development. Think of a group of densely made skin-and-wood houses constructed into a natural cliff face, like the Anasazi, but lacking the cultivation elements. Perhaps the early Anasazi, which later advanced. Unlike the rural example, this hex adds much more: 2 food instead of one, and an additional labor. Now, what is labor? I'm viewing it for the game as the amount of activity (a fifth employed in craftsmanship), as well as the kinetic nature of the hex. The players, wanting to hire a guide, need to find a place with at least one labor. If they want to hire a gang, that might require up to two labor. We can see, as well, what the people are working on, listed under "crafts." A hex of this status would certainly have a monolith, which isn't as magnificent as one might suppose. It is just a big thing. However, 1 in 100 would have something truly impressive: like a Stonehenge, inexplicably present despite the low population and density. There's very little chance for one: there aren't that many Dev-5, settlement-5 hexes in my whole world. I think people can appreciate how these two hexes differ quite a lot from each other: but then, we're talking town and country, so that's not surprising. However, I've tried to hit the highlights, so that a DM describing people entering this little settlement has something to build a description on, with an idea to where people are engaged, who runs the place, how connected it is, how they're willing to exchange with the party and so on. Okay. Let's move to a higher development. Now, we would expect this to be different. After all, we're agricultural now. The hex is no longer "sylvan" ~ it is a collection of privately owned settlement farms, with light organization, touching but not cheek-and-jowl. Much like Kentucky in the early 19th century, or most of Europe in the 11th. There might be a hamlet, but these would have no more than a dozen domiciles. The land is similar, but not as ideal. Rural-5 hexes are more common at this regional density; as well, they are used differently. 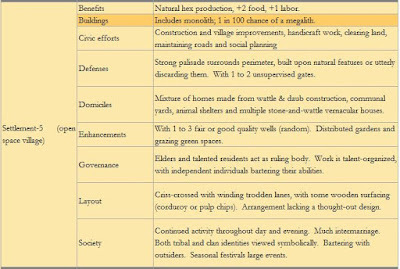 There are a lot more different kinds of improvements (still determined by trade references), these things adding happiness (coffee, sugar, wine), health (mistletoe, salt), food (crops or livestock) or labor (working animals like horses, oxen or dogs). There's an enhancement in the shape of a well, and cart tracks as routes (though not that well maintained, since this is only a rural-5 hex; rural-4 hexes would be better maintained). This would be a very different place from its Dev-5 counterpart. But that is the idea. We've left that other place and come here. Small error in the layout, but oh well. The benefits, one will notice, are the same ~ but there is that increased chance of the rural lands around the city adding so many new references. However, the Dev-6 new techs don't add any notable buildings, not even pottery/granaries, as I envision this development as representive of those 4,000 years between our becoming agricultural and granaries being built. It isn't that the people here don't know what a granary is ... it's just that there's no crippling need to build one. The population isn't that high, so famine is unknown. Granaries do appear at Dev-7. The enhancements include gardens, which are merely spaces where the natural environment has been tailored, or trees planted, to make a resting place in the evenings, inside the settlement. Governance has dispensed with the chief; organization requires multiple voices. Where is says, tribal and clan identities viewed symbolically, it means that we still recognize ourselves as such and such a clan, but we identify ourselves more strongly as members of the community than as individual families. The rural folk still strongly identify as clans and tribes. I hope this gets more across about what I'm doing here. This is still just a small piece, like the health table, but patiently I am pulling a lot of this content together. I expect to still be working on this for several years, at least ... but I hope to have a guiding set-up as far as Dev-9 within a couple of months. When I have five development levels generally worked out, from 5 to 9, then I'll start making presentations about what the overall development looks like, on a regional scale. This is exciting and look forward to seeing more! Development irradiates from a cental urban source, spilling onto the surrounding rural subhexes, right? A population centre on an off-centered sub-hex might then spill over its effects into two, potentially three different hexes? The complexity implications make my head hurt. This is a true grognard's quest, that is for sure. Wow. This is absolutely amazing! You've succeeded on bullet point one, as so many ideas flourish in my head when I read these descriptions. Bravo! One thing, though - I would like to see more discussion of the specifics of what you did to derive certain information - I find that interesting and it makes retracing your path (or doing something similar) easier. I feel that lately we have mostly seen either the finished product, or a general description of the kinds of skills and broad techniques, rather than specifics.